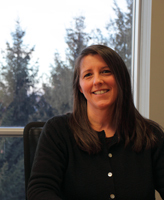 Sarah's extensive experience in real estate stretches to every corner of Vermont. She has worked with buyers, sellers, and lenders in the purchase and sale of real and personal property. Sarah has a comprehensive understanding of transactions involving distressed properties and works closely with banks on REO properties and short sales. Sarah makes it a priority to communicate with clients and keep them apprised of all stages of their transaction. Sarah is graduated from the University of Rhode Island and Boston University School of Law with a Juris Doctor and concentration in legal philosophy. She is admitted to practice in Vermont and is a member of the Vermont Bar Association and the Lake Champlain Chamber of Commerce. Sarah lives in Westford, Vermont with her husband, two sons, two dogs, and a cat. In her free time, she chairs the Westford Conservation Commission and either competes in sports or cheers for New England teams.